From the designer: One of the challenges in designing the Montiel course was to find a way to fit nine holes into the long, narrow piece of property. Adding to the challenge was the sizeable (60 foot) change in elevation from front to back of the parcel. Hole #5 is the last of the uphill climb holes that were predicated by the topography of the park site. An interesting feature of hole #5 is the "rock garden" off to the right side of the basket. A tee shot that strays right will leave you pretty tricky footing for your putt. Admittedly, hole #5 can be pretty tough for lefties trying to throw a hyzer shot, and it's even tougher when you move back to the B tee. 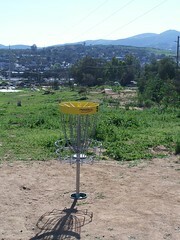 Hole #5 is another one where if you try to land right at the basket you run the risk of skipping far past.